My all-time favorite food is Enchiladas! It doesn’t matter whether its cheese, beef, or chicken, I just love all of them! I like my enchiladas rolled with cheese on top smothered with red or green chili sauce with a sunny side up egg on top along with beans, rice, tortilla, and maybe a salad. It is my comfort food because it reminds me of my childhood days and cooking with my grandma and aunties. Growing up in the southwest I enjoyed making them with my aunties for special occasions like birthdays, graduations, and religious events. 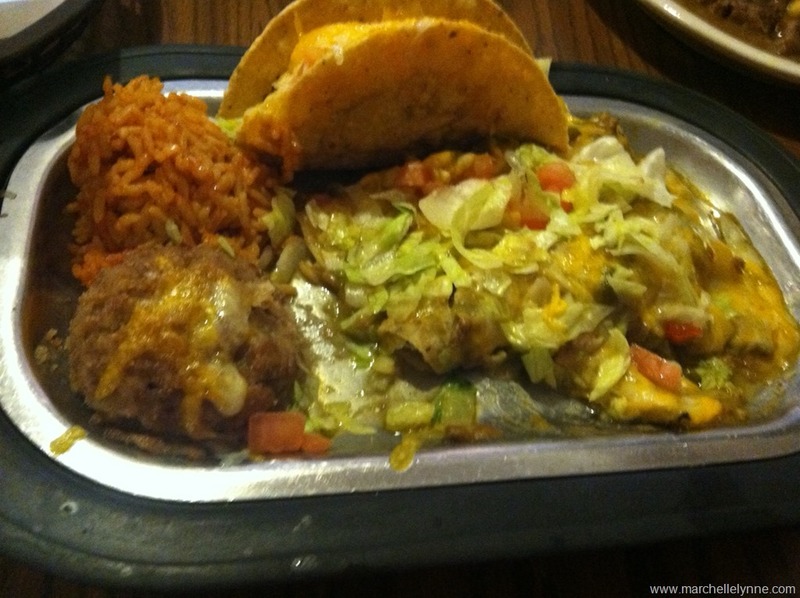 If I was in town, I liked going out to dinner at a Mexican restaurant and getting enchiladas. 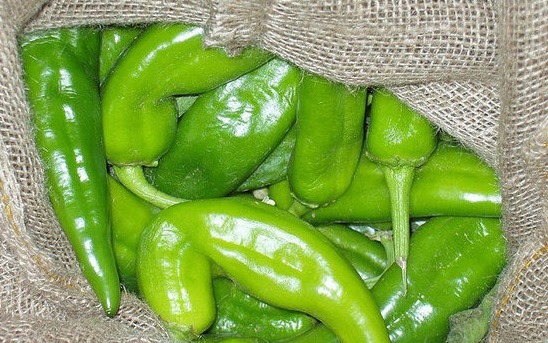 The picture above is a recent picture I took when I was at one of my favorite Mexican restaurant in New Mexico, which also has some of the best green chili around! But ever since I moved to the Southeast three years ago, I have yet to find that same kind of delicious Enchiladas! I have tried nearly all the Mexican restaurants around but nothing seems to satisfy my taste buds and give me that comfort. When I order an enchilada plate it does not ask for red or green chili. All the menu says is that it is smothered with “chili sauce” and when I get my food it looks like spicy white gravy sauce. 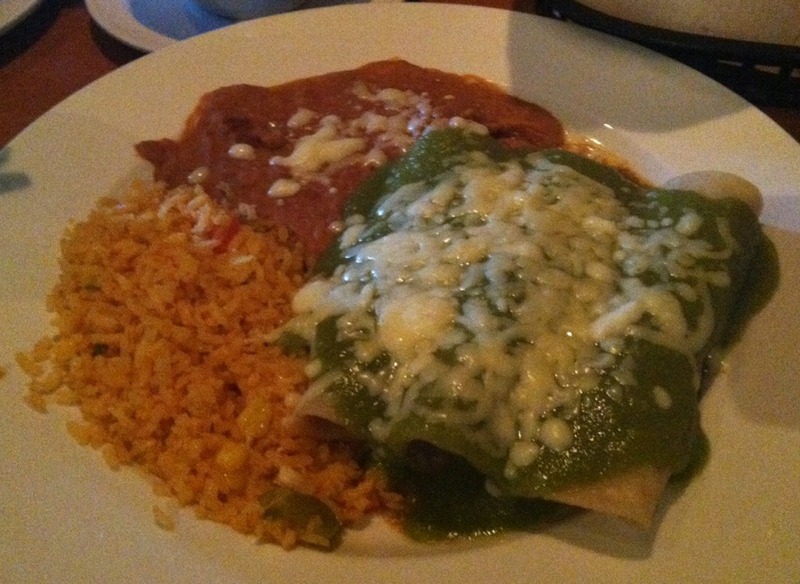 On other occasions if the menu asks for red or green chili, it comes out looking like some kind of spinach sauce. As I look at the picture above it does not look appealing and doesn’t look like something I would eat. I took this picture at a Mexican Restaurant in Georgia. Now don’t get me wrong, there are other things on the menu in the Southeast that are good. The salsas they served are delicious and the tacos on the menus are also good. But as for my comfort food, the enchilada, they just don’t seem to get it right. But I am not giving up on my search, I know there is a restaurant out here that could possibly make my kind of enchilada. Until then I will keep enjoying it when I visit home.